For those who love purple, this listing is for beautiful deep purple Amethyst stack rings. 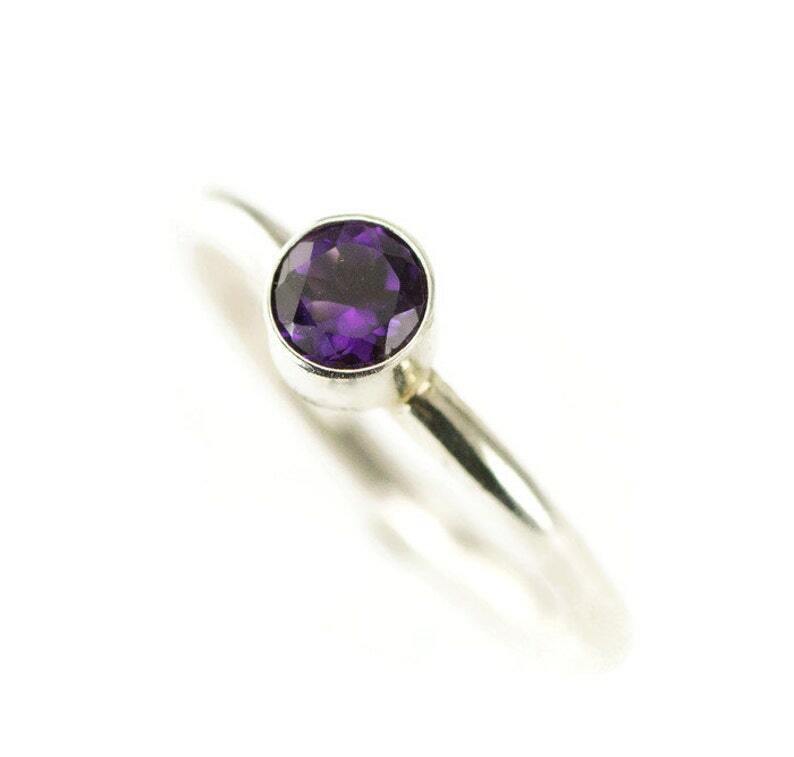 This February birthstone ring is a dark rich purple and you can choose 6mm, 5mm or 4mm size to start or add to your stack ring collection or to start your family ring set. I show the amethyst sterling rings in the 5mm in the main photo and 6mm next to 4mm in the second photo. You can never have too much purple! Please be sure to also write your preference of band Finish - polished, brushed or oxidized or any combination like "hammered oxidized" in notes to seller at checkout. I will contact you for any information not provided. This ring is available in solid 14k gold as a custom listing, just contact me for details. Patterns available in 14k gold are bands A,B,C,E and F and can be done in solid gold or mixed sterling and gold. Getting the correct size is important since many stones cannot take heat needed to re-size. I would be happy to send you a free ring sizer after you check out, just leave a message in notes to seller that ring sizer needed. Once you have received the sizer, you can contact me with the correct size for your ring. If you have selected the wrong size initially, I can then correct it and make your ring. All my rings are custom made to your specifications. I normally ship within 3-5 business days from the time of your order.